Jason Allard, Hudson Bay Company clerk, and James W. Robertson, Canadian Dairy Commissioner, contributed to some of the folklore that surrounds “big cheese”. 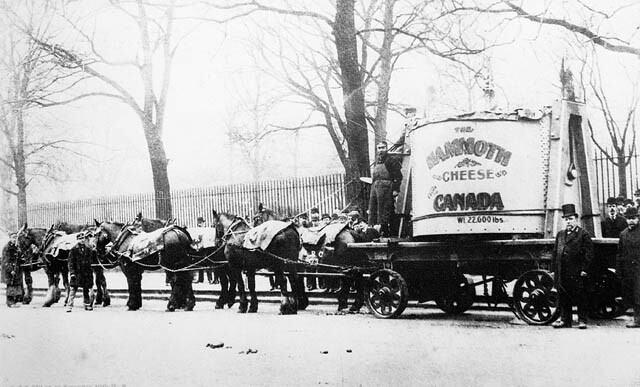 The second big cheese story is the Mammoth Cheese, made in Perth, Ontario, to celebrate the 1893 Chicago World’s Fair. James Wilson Robertson (1857-1930) was a Scot who immigrated to Canada (3). He and Sir William Macdonald were responsible for the introduction of manual training and home economics into the Canadian school system. His story began with the Dominion Experimental Farm at Perth, Ontario. Someone decided it would be original to make a huge cheese for the 1893 Chicago World’s Fair. Robertson as an experienced cheesemaker and instructor in dairying was instrumental in sourcing the quantities of milk needed to make a 9,900 kilogram (22,000 pound) mammoth. The Mammoth made it to the Fair and back again, and was eventually bought by a British tea magnate (who didn’t find it very tasty). A piece has been preserved at the Perth, Ontario Museum, where there is also a six-foot high replica of the Mammoth (4). An Ontario poet of the times wrote an ode to the Mammoth cheese, which has achieved fame as the worst poem ever written about agriculture (5). While Robertson catapulted his cheesemaking abilities into becoming Canada’s Dairy Commissioner, Allard became better known for his diplomatic and leadership skills. (1) B. A. McKelvie, “Jason Allard: fur-trader, prince, and gentleman,” BC Historical Quarterly, IX (1945), 243–57.